Stylish, comfortable and most importantly affordable women’s clothes. Wellington designers and co-owners Sue & Murray Moar, have created a look uniquely their own. “Fit, fashion, quality and flair. These are the benchmarks of our brand. Every design we create – from the fabric we select to the placement of the zips are measured against these elements.” said Murray. “We’re passionate about our work. It’s so personal for us – when people come into Fin we want them to feel as excited about our clothes as we do. And we want them to leave our store feeling beautiful in our designs. It’s why we do what we do, and why our customers keep coming back” adds Sue. Fin Clothing is sized from XXS to XXL available through the on-line shop. The vintage fabrics change regularly and include: polka dots, stripes, florals, paisley, plaid, checks, Hawaiian, all in a variety of colours. 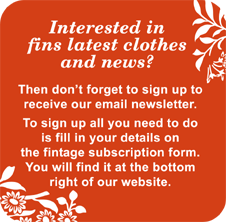 Most of the clothing in vintage fabrics are one of a kind so please visit the website in the Lucky Dip section of the catalogue and Facebook page often to see whats available you can also email Sue fin-clothing@fin-clothing.co.nz or phone Sue on 021 311 246 to discuss options.